At Irish Rosettes Pet Store, Your Animal’s Needs Come First. Our fully stocked pet store comes with everything your pet could possibly need. We stock competitively priced, nutritionally rich dog and cat food that will keep your fluffy friend healthy and happy for years to come. We provide fully equipped dog kennels that are much larger than the minimum requirements. Our dog hotel is perfect for both short & long-term stays. We treat all the animals in our care with the utmost respect and strive to make our kennels a home away from home. Our state of the art cattery comes with thermostatically controlled heating and a full range of scratching posts and toys to keep your feline friend stimulated and curious. Our team give every cat in our care, the love, care and attention they deserve. For more information on the features of our professional kennels and cattery, please get in contact with Irish Rosettes Pet Store today. Situated on the old main Dublin to Belfast Road (R132), we are a local, 100% Irish owned and family-run pet shop, kennels & cattery. Here you will find everything your pet needs from food to accessories to accommodation and care for guests during their stay. 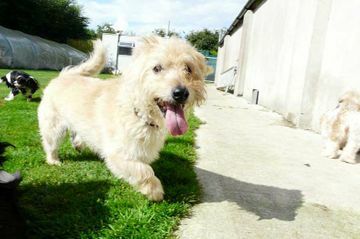 For dogs in Swords, our kennels are just a short drive away. Our kennels and cattery have welcomed beloved pets from Lusk, Skerries, Malahide, Swords, Balbriggen, Rush and even further afield. In store we take great care and attention to source top-quality products for you and your pet so you will find all you need to make an informed decision in choosing the right product for your needs, be it a dog with a sensitive stomach or a fish with a funny looking fin we have the food and products to help. Leave your best friends with the best people and let them enjoy their holiday as much as you do! Specialising in quality care and attentive service, Irish Rosettes is your pet's home away from home! To check the availability of our cattery and Kennel please fill in a convenient enquiry form.